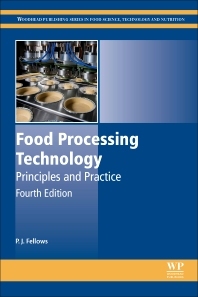 Food Processing Technology: Principles and Practice, Fourth Edition, has been updated and extended to include the many developments that have taken place since the third edition was published. The new edition includes an overview of the component subjects in food science and technology, processing stages, important aspects of food industry management not otherwise considered (e.g. financial management, marketing, food laws and food industry regulation), value chains, the global food industry, and over-arching considerations (e.g. environmental issues and sustainability). In addition, there are new chapters on industrial cooking, heat removal, storage, and distribution, along with updates on all the remaining chapters. This updated edition consolidates the position of this foundational book as the best single-volume introduction to food manufacturing technologies available, remaining as the most adopted standard text for many food science and technology courses. The book provides a comprehensive overview of all available processing technology for various types of food. It contains bot classic techniques and recently developed technology. Well explained, both in words, numbers and visuals, which leads to a quick understanding of each technique. Dr Peter Fellows is a senior consultant in food processing, working mostly in Africa and Asia. Over the last 30 years, he has worked extensively as a food technologist in over twenty countries, supporting institutions that promote small-scale agro-industrial development programmes. He is a Visiting Fellow at Oxford Brookes University in the UK, and has held the UNESCO Chair in Post-Harvest Technology at Makerere University, Uganda. In addition to Food processing technology, he has written 22 books and numerous articles on different aspects of food processing.